Saturday, October 7, 1911: Hulled some walnuts this afternoon. Tried to be careful of my hands, but they got stained somewhat. Black walnuts grow semi-wild in Pennsylvania–and across much of the US. The hull is the outer husk. It must be removed to prevent spoilage. The nuts are then dried. After they are dried they can be cracked. Crack hulls with feet. Then use hands to remove. 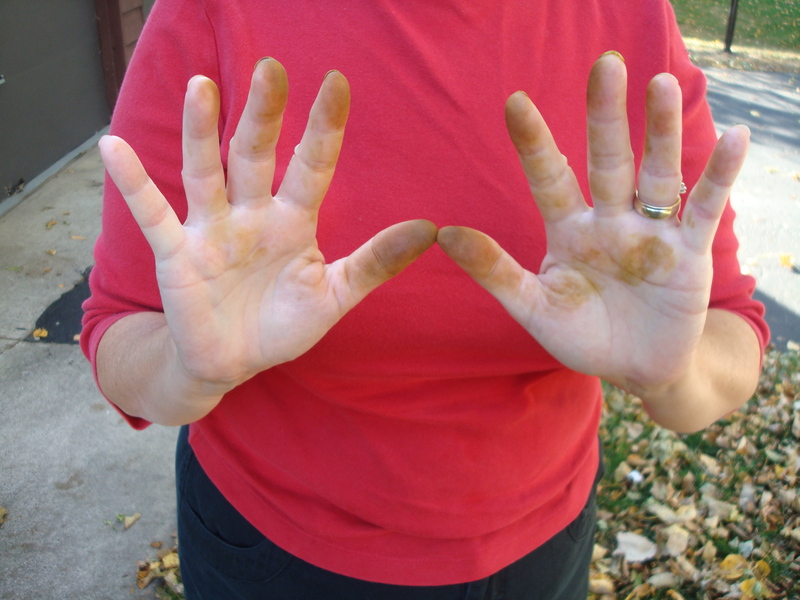 Last week-end my husband and I gathered some black walnuts at a park. We took them home and hulled them. We put the nuts in an old net onion bag and hung them in the garage to dry. They’ll be ready to crack and eat by December. Oct. 15 Addendum: I mentioned putting the walnuts in a net onion bag to my father. He was horrified and said that they would mold. He said they should be spread out on newspapers in a cool dry place (an attic is ideal). So I checked my walnuts and noticed that two of them had a spot of mold of them. I discarded those walnuts–and spread the rest out on newspapers to dry. Stay tuned . . .
Nov. 9 Addendum: I’ve now successfully cracked some black walnuts. 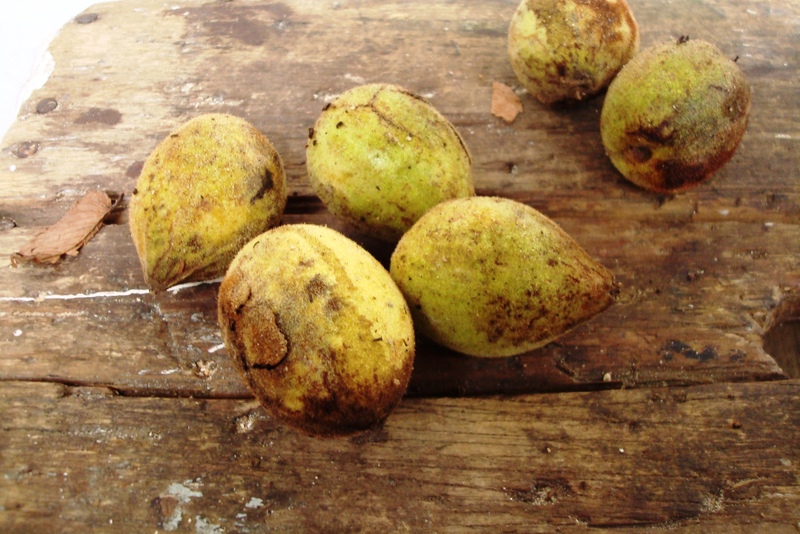 Click here for today’s post on How to Crack Black Walnuts. Posted on October 7, 2011 August 23, 2012 by SherylPosted in Farming and GardeningTagged black walnuts, diary. The stain IS amazing! 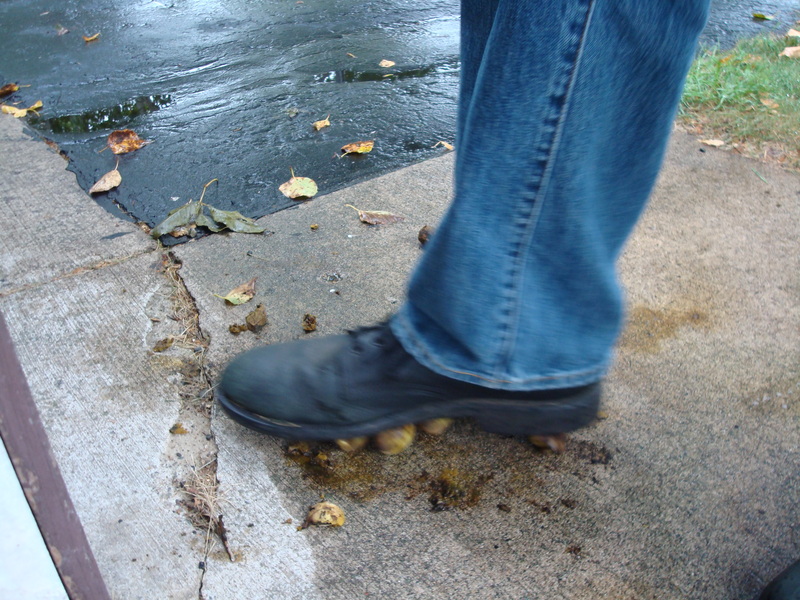 I hulled black walnuts for the first time a few years ago- a whole huge bucket full, and the stains stayed with me for a week! I have wondered ever since if I could actually use this for a good purpose… I recommend medical gloves to prevent staining. I’d also like to know how you crack these things when they are dry… We ended up smashing them with a hammer, or squeezing them in the vice, but the nutmeat was virtually ground into bits by then! They were tasty little morsels though, and worth the effort if I knew how to open them properly. I’vee never cracked black walnuts, so I’m not sure what is the best way to do it. My husband says that he can remember his family using a hammer. In December there will be a diary entry that talks about picking the nut meats out of the shells to make cookies. I’m going to crack my walnuts then–I’ll let you know how it turns out. My dad was born in 1912. We went nutting a lot when I was a kid. We would carry a gunny sack to put the walnuts in, hickory nuts too. My dad would pour all the walnuts on the concrete floor of the barn and drive back and forth over them with his farm truck to hull them. We would then remove the hulls and put the nuts on newspapers or gunny sacks to dry. When we cracked them in the barn, dad gave me and my little sister each a hammer and we cracked them on his old big anvil. If it was cold we cracked them in the house on top of my grandmothers irons, the kind you had to put on the stove to heat them up. I must say I had many smashed fingers. Thanks for sharing your story. You describe the process so clearly. It almost makes me feel like I was there. Stay tuned–When I try to crack them I’ll write a post about how it turns out. It also amazes me how sharp squirrel teeth are. I see them nibbling on black walnuts all the time! What a great web site! I’d never realized that there are so many ways to crack black walnuts. My husband thinks that the vise looks like the best idea. I can hardly wait until my walnuts are dry enough so that I can try cracking a few. My husband and I cracked a few of the walnuts over the week-end. We put them into a vice to crack them–and had problems with the walnuts flying all over the garage. We then covered the walnuts with a piece of cloth before cracking. This worked really well at containing everything–and it was easy to get the nuts out of the cracked shells. They tasted great–just like I’d remembered from my childhood. The flavor is more intense than grocery store walnuts–but it is really good. I love your info on black walnuts. If you check out my blog you’ll see I wrote recently about what we do with ours. Please don’t hate me. The squirrels need food too. You’ll understand when you read it. I really like your blog. Your method works for me!